He's not a man without a county, but he is a hockey fanatic without a favourite NHL team. At least that's what Prime Minister Stephen Harper keeps telling us. Of course, Harper's love of hockey has been well-documented. He is a member of the Society for International Hockey Research, attends many NHL games (even if he sometimes gets in hot water), unveiled a monument in Canada's national cemetery to the father of modern hockey, appointed a Cup-winning coach to the Senate and wrote a hockey book in his spare time that will be released this November. Last night, Harper took to Twitter to share his excitement at the start of a new NHL season. But despite all of this, the prime minister — who grew up in Toronto, lived for a time in Edmonton and now represents Calgary — is notoriously coy about his preferred team. In fact, a Harper spokesperson told HuffPost Canada on Wednesday the PM backs no team in particular. "The Prime Minister cheers for all Canadian teams," wrote Carl Vallée. And how did Vallée respond last summer when a National Post reporter asked why Harper called Calgary the "greatest city in Canada" despite reports he is an "avid Maple Leafs fan"? "The Prime Minister cheers for all Canadian teams," Vallée told The Post. This was evidently the same message Postmedia received during the 2011 election. While a Post story outed former Liberal leader Michael Ignatieff as a Montreal Canadiens fan, Harper's folks told the paper his favourite NHL team was... Team Canada. Harper's current rivals, however, aren't nearly as shy. NDP Leader Thomas Mulcair is "a huge Habs fan," an NDP staffer confirmed to HuffPost via email, while Liberal Leader Justin Trudeau frequently tweets about his love of the Canadiens. Trudeau even swore in French via a tweet after the Habs blew a lead during a playoff game last year. But while Harper may not want to divulge his favourite team — and maybe he really doesn't have one — some serious and highly journalistic research reveals his loyalties may have shifted over the years. The prime minister has said he grew up a Maple Leafs fan in the Toronto neighbourhood of Leaside. His book, "A Great Game: The Forgotten Leafs & The Rise Of Professional Hockey," documents Toronto's first professional team, among others. And at an event honouring former Leafs and Habs coach Pat Burns in 2010 Harper said one of his fondest memories of Burns was when he led the Leafs to the Stanley Cup semifinals in 1993. "[It] just goes to show that when it comes to the Maple Leafs organization, that a great coach can take a team a long way, but only God can do miracles," Harper joked. A hockey book on "forgotten" Leafs? Fond memories of '93? A joke that only a Leafs fan can get away with? Case closed, right? HARPER IS A LEAFS FAN! During the Canadiens' surprising playoff run in 2010, Harper said he also cheered for Montreal as a kid, according to The Toronto Star. Harper said at the time he would have no trouble cheering for the Habs once again if they made it to the Cup finals. (They didn't). "I have no problem cheering for the Canadiens when the time comes. I grew up as a Toronto Maple Leafs fan, which means that I only had Montreal to cheer for in the playoffs," he told reporters to laughter. In 2009 he appointed Jacques Demers, who coached the Canadiens to a Cup in 1993, to the Senate. So, there we have it. Harper is a Leafs fan who will cheer for the Leafs' most hated rivals when the Leafs aren't in the playoffs but the Habs are. In a recent ebook from Postmedia's Mark Kennedy, Harper's former flame, Cynthia Williams, opened up about how the pair started dating in the early 1980s, not long after Harper moved out West. "The pair loved to watch hockey — he was an Edmonton Oilers fan — and often went to the Calgary Zoo," Kennedy wrote. Hmm… okay. To be fair, lots of Canadians were bewitched by the Oilers in the 1980s thanks to a guy by the name of Wayne Gretzky. So, Harper is a Leafs fan who sometimes cheered for the Habs and supported the Oilers when they were really, really, really good. 2004 was an interesting year, eh? Jarome Iginla led the sixth-ranked Calgary Flames to within one win of the Stanley Cup. (Sorry, HuffPost Alberta). But what else happened? Oh yeah! An election! Right around the same time! And Harper, by that point a Calgary MP and leader of the new Conservative Party, sure wasn't shy about rocking team colours. Like when he addressed members of the Tory caucus about two weeks before the writ dropped. Or during Game 7 of the Stanley Cup final, which happened to occur while the campaign was underway. A Paul Martin ad aired while he was in attendance, which had to have been awkward. Years later, when Iginla was traded to the Pittsburgh Penguins, Harper tweeted he was an "all-time Flames great." So, Harper is a Leafs fan who sometimes cheered for the Habs, supported the Oilers when they were good and loved the Flames during the 2004 election. Where Did He Get That Ottawa Senators Jersey?! Remember when the Senators went to the Cup in 2007? Well, it didn’t sit well with a lot of Leafs fans. After all, the "Battle of Ontario" rivalry between Ottawa and Toronto has blossomed into one of the best in the league. No matter for the PM though, who was caught wearing a Sens jersey during game three of the eastern conference final in 2007. And when Harper visited former Afghan president Hamid Karzai just weeks later, the prime minister presented him with a baby jumper featuring the Sens logo in honour of Karzai's new son. Now, we know what you're thinking. 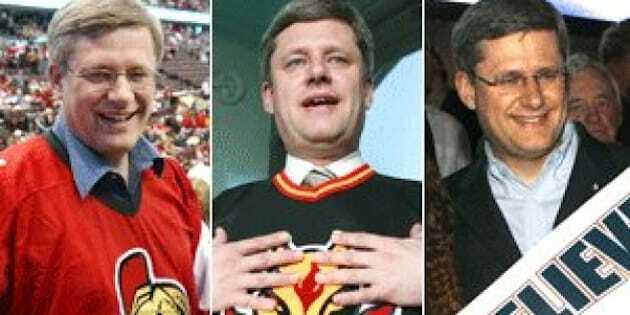 Harper, as PM, was excited that a Canadian team had made it to the Cup final. No big deal. The Oilers came within one win of capturing the Cup in 2006 and, to the best of our knowledge, Harper cheered them on but didn't sport a jersey. (Again. Sorry, HuffPost Alberta). So, Harper is a Leafs fan who sometimes cheered for the Habs, supported the Oilers when they were good, loved the Flames during the 2004 election, and was jazzed about the Senators' Cup run in 2007 but a little less so about the Oilers of 2006 or Canucks of 2011. Maybe the prime minister just likes getting behind winners? If so, maybe Team Canada should be his team after all.